Last month I had a debate at the Royal Institution with Lord Drayson, the Science Minister, in which he argued that I was too harsh on British science coverage, which is the best in the world. During this event our chairman (bizarrely and excellently Simon Mayo) pulled out a health front page from the Express, and asked what we thought about it. I said the article might well be accurate, but it’s also quite likely to be a work of fantasy, and as a serious matter of public health I would urge people to be extremely sceptical about health information on the front page of the Express. Lord Drayson thought this was cynical and unfair. He warmly encouraged us to trust this newspaper. And here comes the proof in a new front page story. “Jab ‘as deadly as the cancer’” roared the giant black letters on the front page of the Sunday Express this week. “Cervical drug expert hits out as new doubts raised over death of teenager” said the subheading, although no such new doubts were raised in the article. We will now break with tradition and reproduce a whole paragraph from the Express story. I’d like you to pay attention, and perhaps build a list of its claims in your mind. This is one of those stories where every single assertion made on someone else’s behalf is false. The story seemed unlikely for three reasons. Firstly, Professor Harper is not a known member of the antivaccination community, which is vanishingly small. Secondly, it was on the front page of the Sunday Express, which is indeed cause for concern. 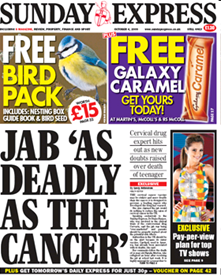 Lastly, it was by specialist health journalist Lucy Johnston, whose previous work includes “Doctor’s MMR fears”, “Exclusive: Experts Cast Doubt On Claim For ‘Wonder’ Cancer Jabs”, “Children ‘Used As Guinea Pigs For Vaccines’”, “Dangers Of Mmr Jab ‘Covered Up’”, “Teenage Girls Sue Over Cancer Jab”, “Jab Makers Linked To Vaccine Programme”, and so many more, including a rather memorable bad science story, the front page: “Suicides ‘Linked To Phone Masts”. Her criticisms of some aspects of cervical cancer vaccination are nuanced and valuable, but they do not fit into the black and white hysteria of the British news media. It would be nice if we could have a public discussion about the relative risks and merits of different treatment options. Sadly, with this kind of ugly reporting, scientists around the world may learn that such a discussion is not currently possible in the UK media. That is the greatest tragedy. Simon Mayo thinks the original version of this article reads as if the the front page story discussed a month ago in the debate with Lord Drayson is actually this week’s cervical vaccine scare story from the Sunday Express. I’ve added an extra sentence above to make it as clear as possible, informed the Guardian, and I hope nobody feels misled. They are of course two separate stories, and my point – which I hope is very clear and also taken – that Lord Drayson is wrong to describe the front page of the Express as a reliable source of information about health. The Express is a reliable source of today’s date. Nothing more. I wish Dr. Goldacre would expand on the first half of his statement, “I said the article might well be accurate …” Surely he recognizes that vaccines are developed, tested, approved and marketed in a manner similar to pharmaceutical drugs. Unlike pharmaceuticals, they are mandated for all school-age children, or they cannot attend school without valid exemptions. I do not deny that vaccines have been beneficial, particularly with diseases like smallpox and polio. However, vaccines have also caused harm, and one has to wonder about the drug industry’s push to get more vaccines on the childhood vaccination schedule. This accelerated after the passage of the National Childhood Vaccine Injury Act of 1986 in the US, which relieved vaccine manufacturers of financial liability due to vaccine injury claims. I can think of no other product that is exempt from liability, and vaccines went from a potential money loser to a cash cow. 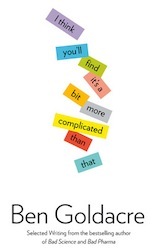 Does Dr. Goldacre or anyone else see the parallels between vaccines and pharmaceutical drugs? Aside from the obvious, what are the differences (ie, vaccines allegedly protect against infectious diseases for the greater good of humanity)? Hello – my daughter has been suffering severe seizures since the age of 18, she is now 24. The onset of her seizures may well coincide with her receiving the HPV vaccine in the UK and I would be interested in any groups, further information or any route to investigate. My daughter health is in a very poor state as a result of these still undiagnosed seizures, she has suffered complications including life threatening bronchial problems following vomiting during these seizures.